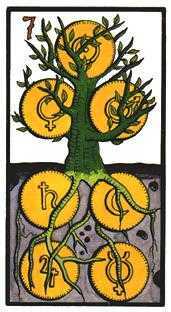 Your personal power is growing and others are taking notice. 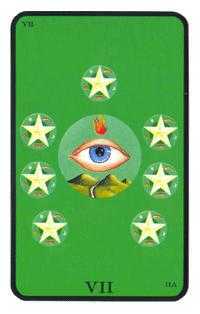 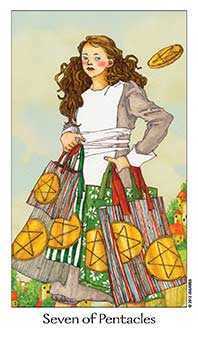 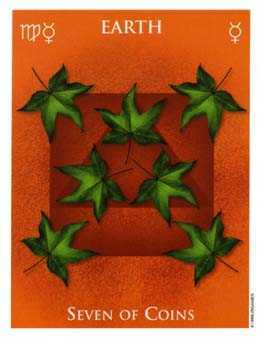 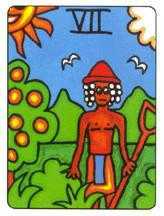 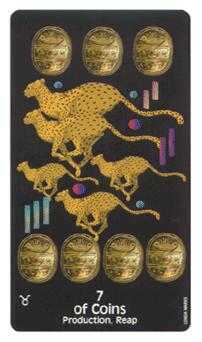 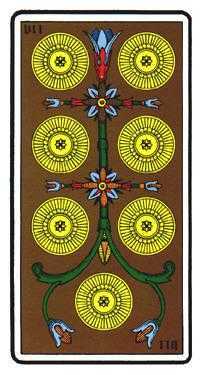 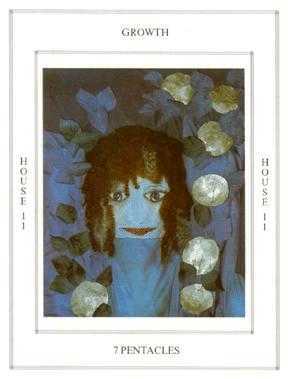 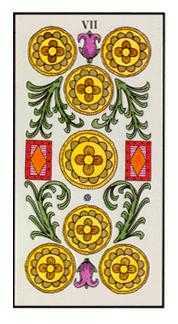 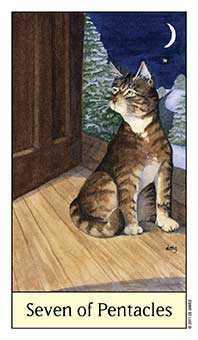 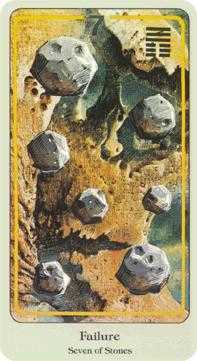 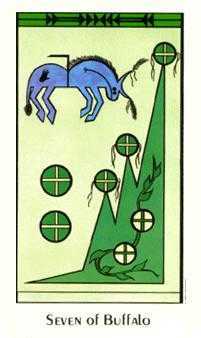 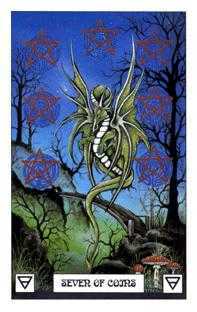 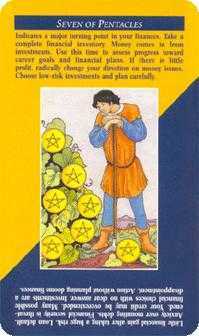 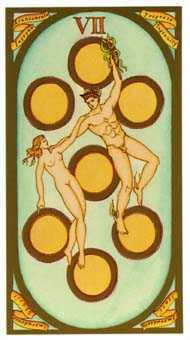 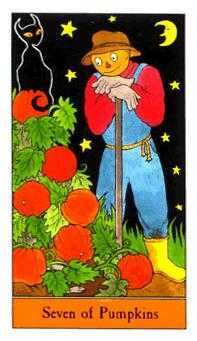 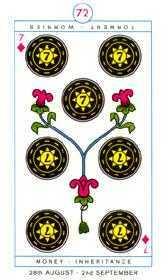 Universal Waite deck © U.S. Games Systems, Inc. 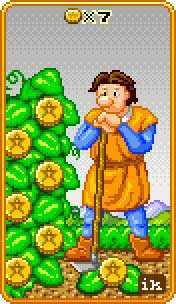 The Seven of this suit is typically a paean to the humble laborer who is willing to show up every day and sweat in the sun for next season's bounty. 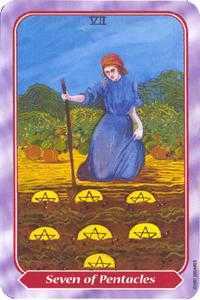 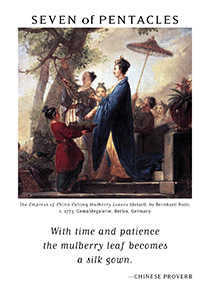 The traditional concept is cultivation, with an attitude that slow and steady wins the race, with faith in nature's assistance. 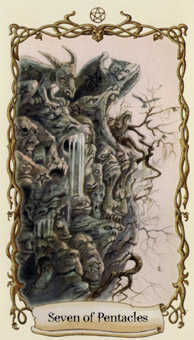 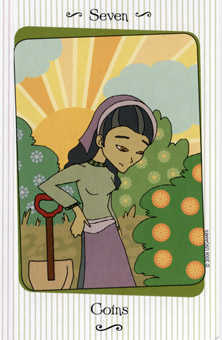 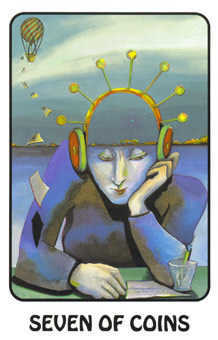 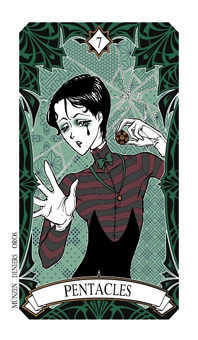 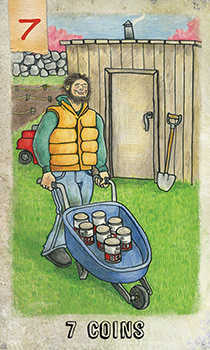 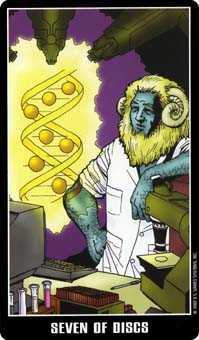 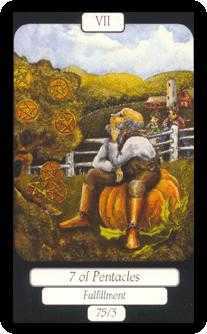 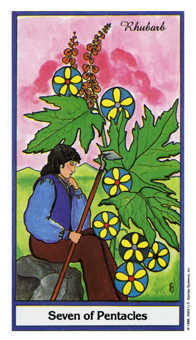 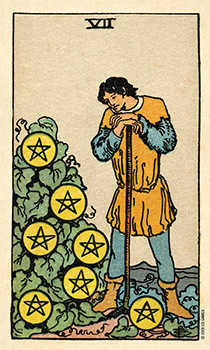 The protagonist of this card doesn't make excuses, isn't whimsical or moody, but is dedicated and sees the job through. 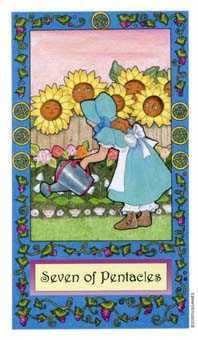 Of course, it's no good to count your chickens before they hatch, but there's no question that the person who is vigilant over a project is more likely to get the desired result. 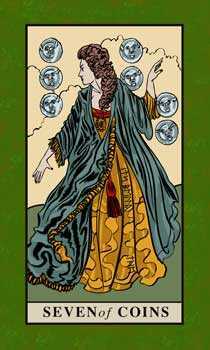 Someone who works with nature, cooperating with her ways, will waste less energy and time than the person who works against her. 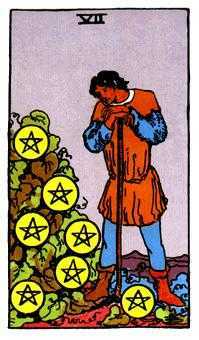 As a side meaning, we sometimes see this normally humble farmer in a moment of frenzy, betting the crop on a roll of the dice. 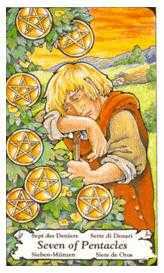 This represents a moment of dementia, addiction or desperation which hopefully will not last long enough for the farmer to lose everything! 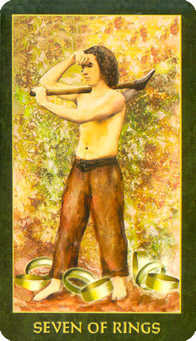 Success is won by perseverance. 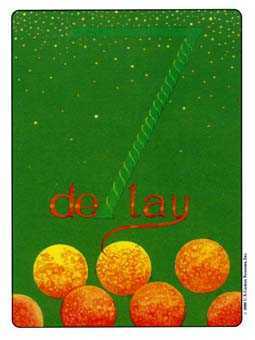 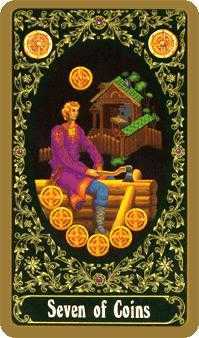 Be resolute in the use of your time and energy. 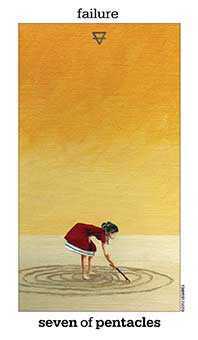 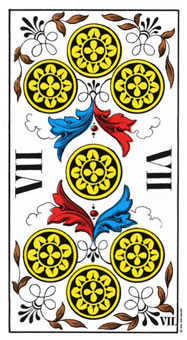 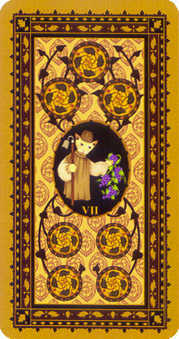 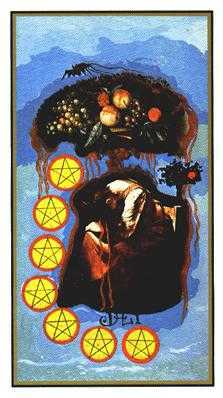 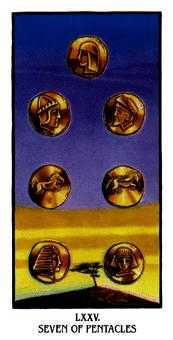 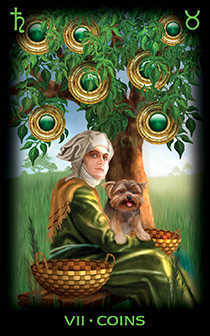 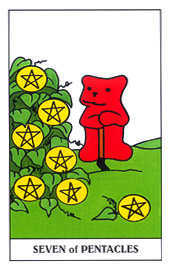 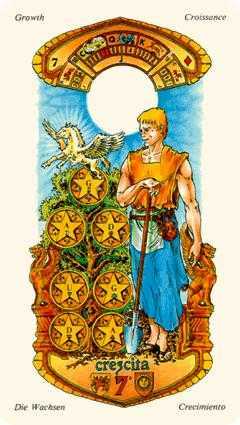 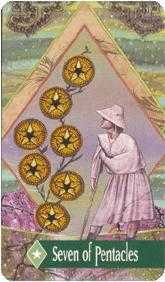 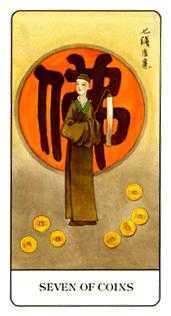 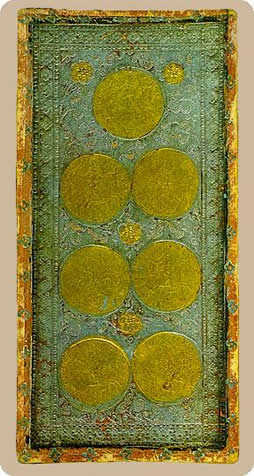 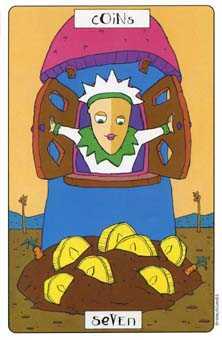 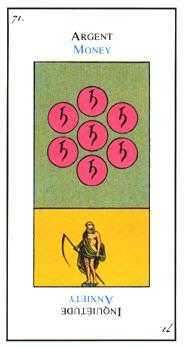 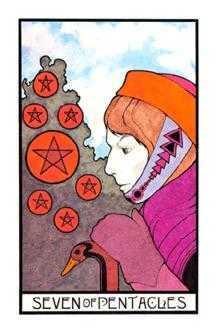 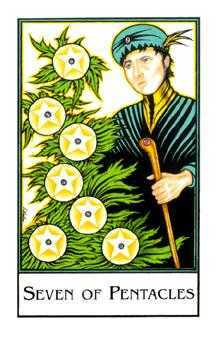 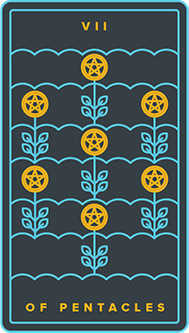 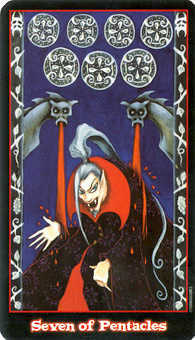 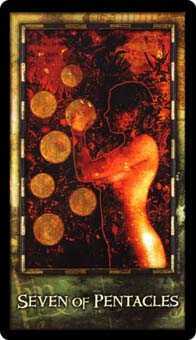 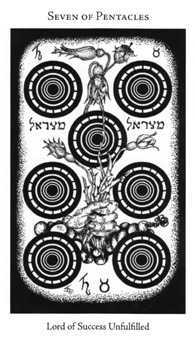 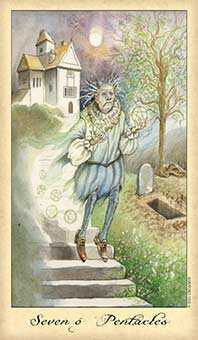 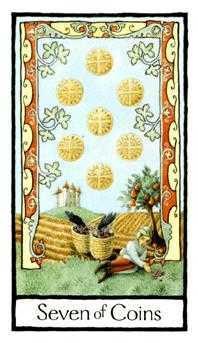 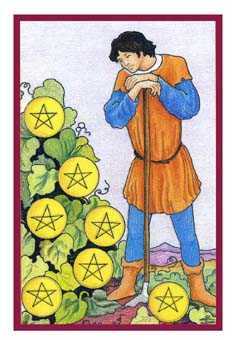 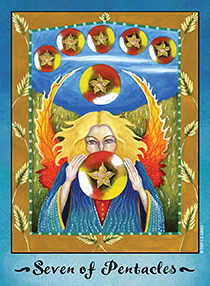 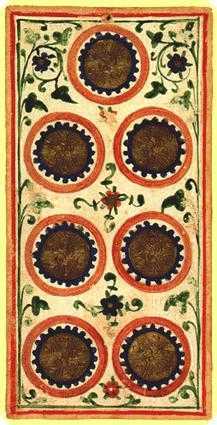 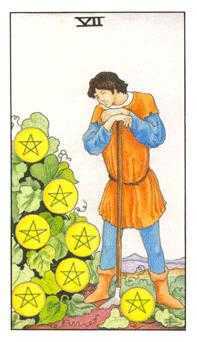 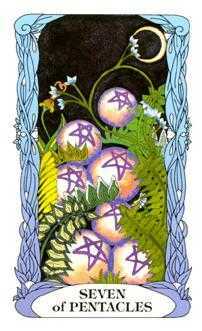 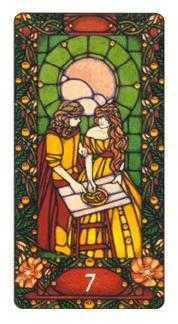 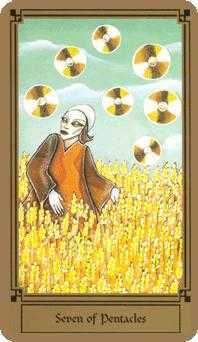 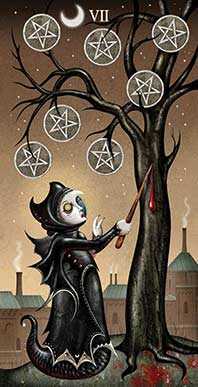 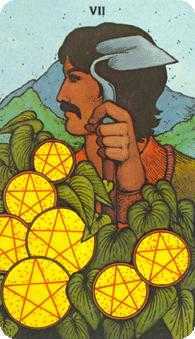 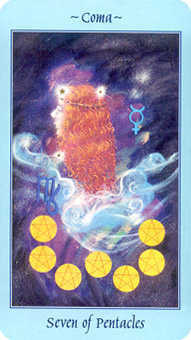 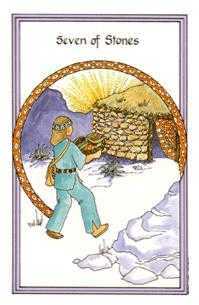 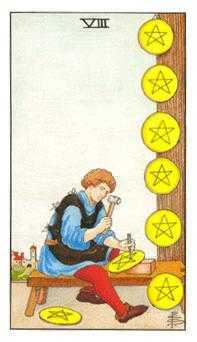 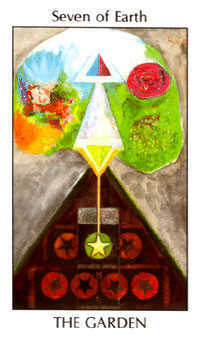 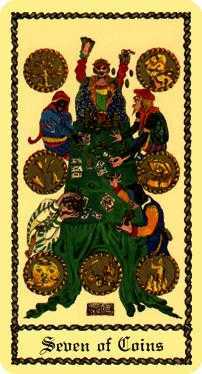 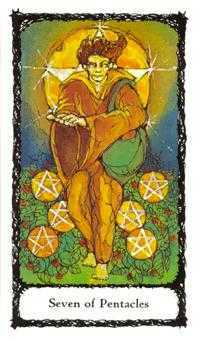 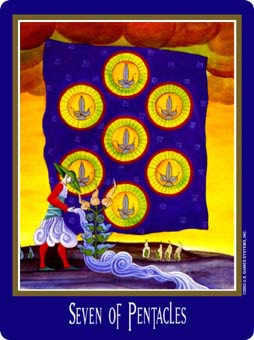 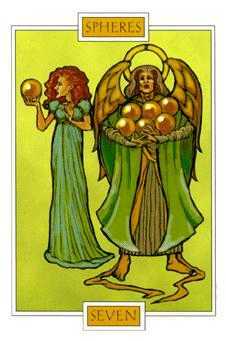 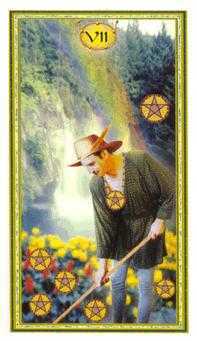 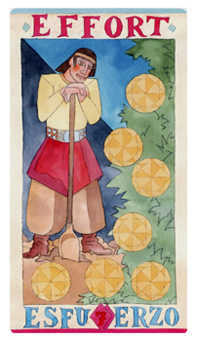 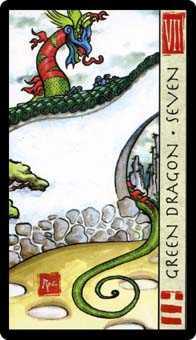 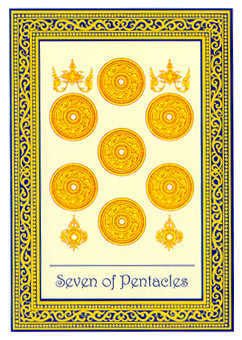 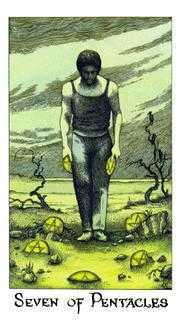 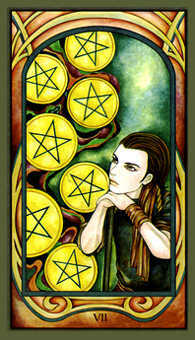 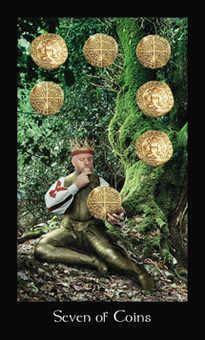 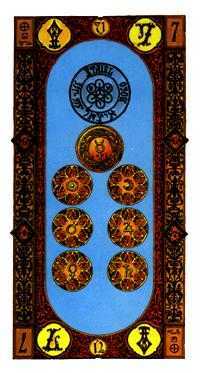 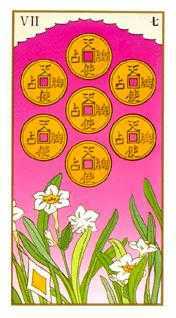 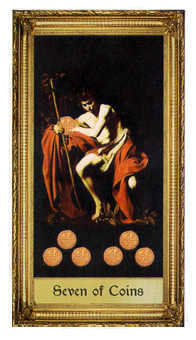 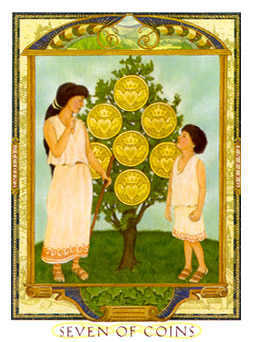 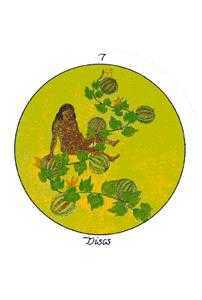 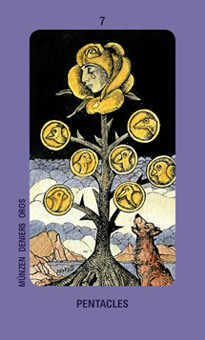 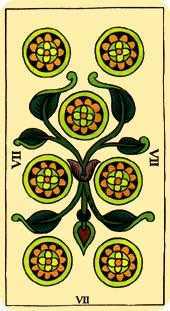 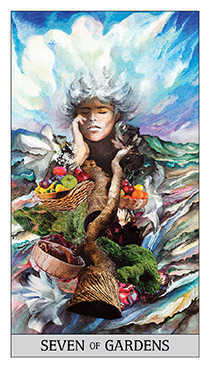 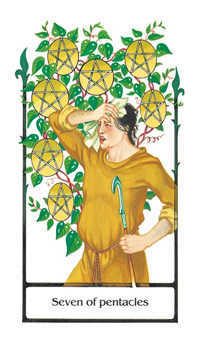 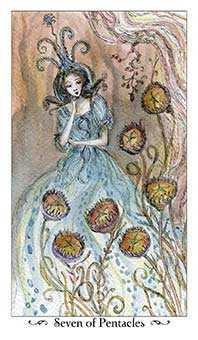 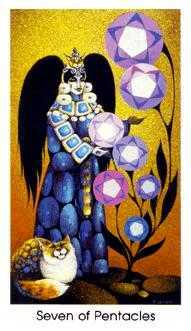 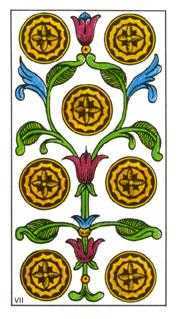 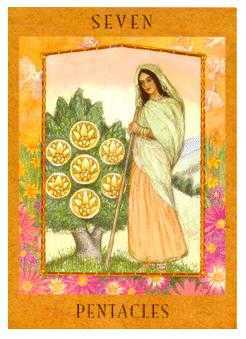 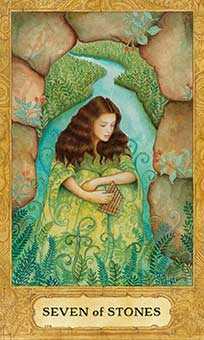 The Seven of Coins in this position advises you to focus on the long run. 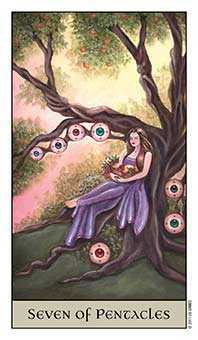 Look beyond this week or this month. 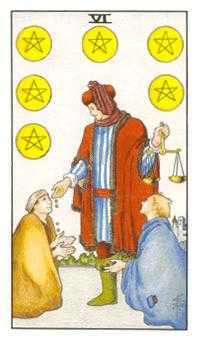 This card exemplifies the magic of compound interest. 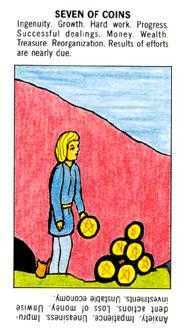 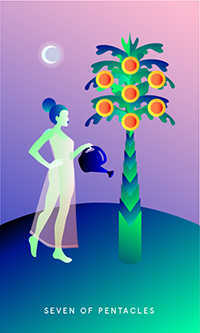 You'll have much better results with a slow and steady investment of time, energy and labor than you would generate by trying to win the lottery. 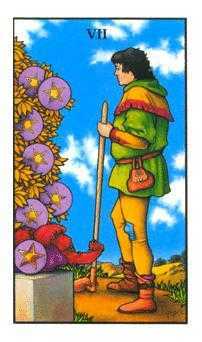 The path to success is paved by perseverance. 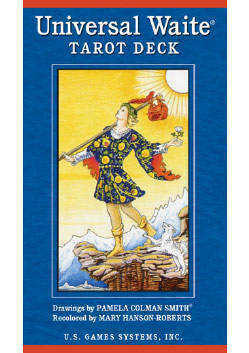 Glamorous or flashy moves cannot take the place of consistent steps in the right direction. 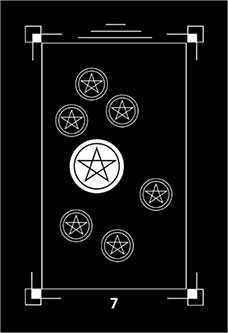 If you do not understand this, perhaps you are moving in the wrong direction or are not motivated strongly enough.